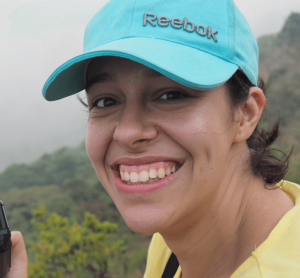 The contest ‘We are scientists, get us out of here!’ in its Spanish version has a winner: Miriam Garcia Santa-Maria, an astrophysicist member of our group and PhD student in the IFF (Instituto de Física Fundamental). She was the most voted scientist by the students of the 17 participating schools in the Zona CSIC, all of them in the villages of the Ciudad Ciencia net. After two weeks answering questions through a chat, students have been able to know more about six scientists and their jobs, their lives and their expertise. 1972 young students, between 10 an d 18 years old, have participated, sending 1366 questions and having 95 text chats online. The ‘Zona CSIC’ received more participants than other zones of the contest. Dr. Javier R. Goicoechea is leading a new research that proves the existence of short-lived molecular cloudlets (ages less than 10,000 years and total mass of about 60 solar masses) around Sgr A*, the location of the super massive black hole at the centre of our galaxy. This research has revealed exciting evidence of molecular gas, the fuel that forms stars, orbiting within the central parsec of the Milky Way at high speeds, up to about 300 km/s. The images (1″-resolution ALMA observations, see above) reveal the small spatial scale morphology of the interstellar gas in this fascinating region and the presence of molecular “cloudlets” (less than 20,000 AU size) at about one light year from SgrA*. 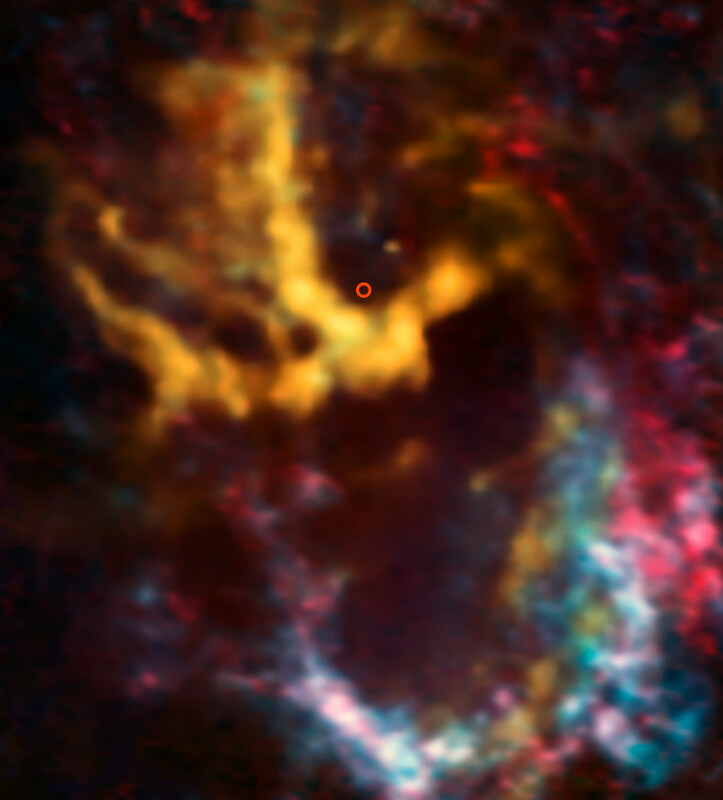 While it is unlikely that the observed cloudlets will directly form new massive stars, their presence is a piece of the puzzle toward understanding the formation of stars close to supermassive black holes. The above image is ESO’s Picture of the Week (see below). This research was presented in the paper “High-speed molecular cloudlets around the Galactic center’s supermassive black hole“, published in Astronomy and Astrophysics Volume 618, A35 (19pp), 11 October 2018. The authors are: Javier R. Goicoechea (Instituto de Física Fundamental, IFF-CSIC, Madrid, Spain), Jerome Pety (Institut de Radioastronomie Millimétrique (IRAM), France), Edwige Chapillon (Institut de Radioastronomie Millimétrique (IRAM) and OASU/LAB-UMR5804, CNRS, Université Bordeaux, France), José Cernicharo (Instituto de Física Fundamental, IFF-CSIC, Madrid, Spain), Maryvonne Gerin (Sorbonne Université, Observatoire de Paris, France), Cinthya Herrera (Institut de Radioastronomie Millimétrique (IRAM), France), Miguel A. Requena-Torres (Department of Astronomy, University of Maryland, USA) and Miriam G. Santa-Maria (Instituto de Física Fundamental, IFF-CSIC, Madrid, Spain). After the Peer Review Panels and final review by the Space Telescope Science Institute (STScI) Director, the James Webb Space Telescope Proposal, led by Olivier Berne (IRAP-CNRS, France), “Radiative Feedback from Massive Stars as Traced by Multiband Imaging and Spectroscopic Mosaics” has been approved for the Cycle 1 Director’s Discretionary Early Release Science (DD ERS) Program with 27.8 hours of observation time. Two members of the team are from our group: Javier R. Goicoechea and Emeric Bron. A total of 106 proposals requesting 3683.4 hours of observations were submitted in response to the DD ERS Call and 13 Proposals for 460 Hours have been approved by the Director. The proposal makes a strong case for the role and significance of interstellar photodissociation regions (PDR) observations with JWST, with a plethora of anticipated science-enabling products and templates for the community ahead of Cycle 2, while also anticipating a series of papers on the ERS data. The JWST launch window is set for March to June 2019. 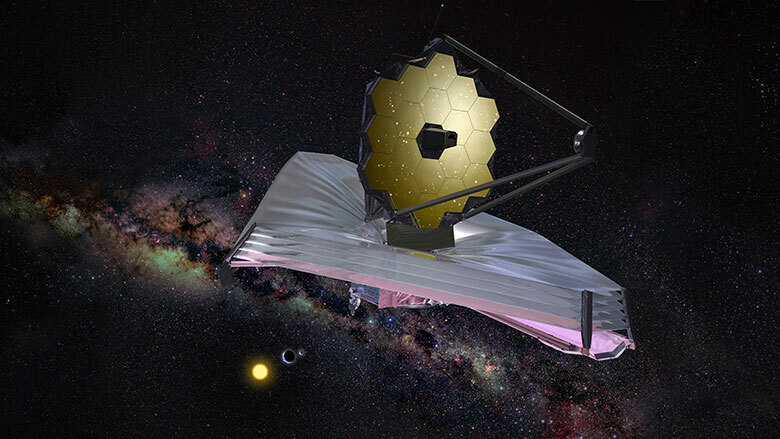 Congratulations on the success of the proposal and best wishes for your future participation in and contributions to the scientific program of JWST. James Webb, el telescopio más grande para desentrañar el universo (European Space Agency Press Release -in Spanish only-). 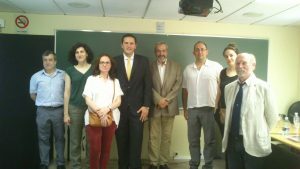 The Molecular Astrophysics Group has three new doctors, who defended their thesis in the last months. Luis Velilla, Alicia López and Sara Cuadrado: here we present a resume of their work. Congratulations! Circumstellar envelopes of evolved stars are the main contributors to the enrichment of the interstellar medium, and are excellent laboratories to study the molecular complexity and the chemical evolution of the Universe. In this thesis, we present our study of the molecular emission in the millimeter wavelength range with the IRAM-30m telescope, Herschel-HIFI, and ALMA, of three circumstellar envelopes around the evolved stars IKTau, OH231.8+4.2, and IRC+10º216. The main results obtained show that the chemistry of oxygen-rich objects is not as poor as it was previously thought. In particular, the chemistry of OH231.8+4.2 has been probably altered by high-speed shocks caused by the interaction between the slow AGB wind and fast (few 100 km· s−1) highly collimated bipolar winds. 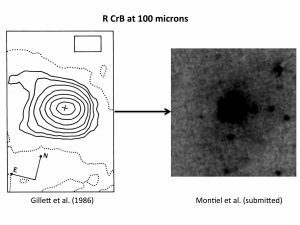 We also present the first sub-arcsecond resolution observations obtained with ALMA, for species such as SiO, SiS, or SiC2 towards IRC+10º216. This work will serve as a reference for future studies of the molecular emission in circumstellar envelopes of evolved stars, particularly for the oxygen rich envelopes. Thesis directors: Carmen Sánchez Contreras, José Cernicharo. Thesis directors: José Cernicharo, Belén Tercero. 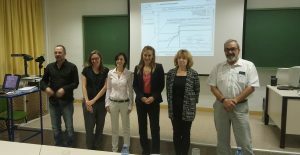 “In this PhD thesis, a detailed study of the molecular emission of the Orion Bar photodissociation region (PDR) has been presented. The Orion Bar is the prototypical warm PDR with a far-UV (FUV) radiation field of a few 104 times the mean interstellar field. Owing to its proximity (~414 pc) and nearly edge-on orientation, the Orion Bar offers the opportunity to determine the chemical content, spatial stratification of different species, and chemical formation-destruction routes in strongly FUV-illuminated gas. We carried out a millimetre line survey of the irradiated edge of the Orion Bar PDR using the IRAM-30m telescope, and complemented it with ~7′′ resolution maps at 0.8 mm, in order to study the chemistry prevailing in molecular gas that is directly exposed to strong FUV fields. Despite being a very harsh environment, our observations show a relatively rich molecular line spectra, with hundreds of lines arising from hydrocarbons and complex organic molecules (Cuadrado et al. 2015, 2017). We have also reported the first interstellar detection of the less stable conformer of formic acid, cis-HCOOH (Cuadrado et al. 2016). In addition, we have used ALMA to observe a small field-of-view with a high angular resolution (~1′′) where the transition from atomic to molecular gas takes place, in the context of investigating the structure and dynamics of FUV-irradiated molecular gas. The images (in the rotationally excited emission of CO, HCO+, SH+, HOC+, SO+, and SO) reveal a pattern of high-density substructures, photo-ablative gas flows and instabilities at the edge of the molecular cloud (Goicoechea et al. 2016, 2017). Thesis directors: Javier R. Goicoechea, José Cernicharo. Acknowledgements: AYA2009-07304, AYA2012-32032, CSD2009-00038, and ERC-610256 (Nanocosmos). The journal Nature recently published an article titled “Multi-molecular views of a stellar nursery” outlining the Orion-B mapping program that is being carried out with the IRAM30m telescope. Two members of our group, Emeric Bron and Javier R. Goicoechea, are involved in this research (led by Jérôme Pety, IRAM) whose goal is to simultaneously image emissions from many different molecules across a very wide area of the star-forming cloud Orion-B, in the iconic Orion constellation. You can read the abstract here and the full article in this link. For astronomers, one of the most important things in order to be able to confirm and compare the huge amount of data received during the observations is to have accurate calibration references. In astronomy, millimetre and submillimetre wavelengths are important to study relatively cold objects in the Universe, such as the interstellar medium, star forming regions, circumstellar matter, planetary atmospheres and highly red-shifted objects. Reference calibration standards are, however, very scarce specially at submillimetre wavelengths (Bands 7, 8, 9 and 10 of the Atacama Large Millimetre Array, ALMA, in Northern Chile). Fortunately, some years ago a team of astronomers suggested the use of the planets of our Solar System as possible calibration references at submillimetre wavelengths. First works developed on that subject revealed the submillimetre lines of Phosphine (PH3) in the atmospheres of Jupiter and Saturn, although the overall shape of these extremely wide features could not be measured due to technical limitations. Now, for the first time, a team has measured the emission of the giant planets Jupiter and Saturn across the 0.3 to 1.3 mm wavelength range using a Fourier Transform Spectrometer mounted on the 10.4-meter dish of the CSO, Caltech Submillimetre Observatory (now retired) at Mauna Kea, Hawaii, 4100 meters above sea level. 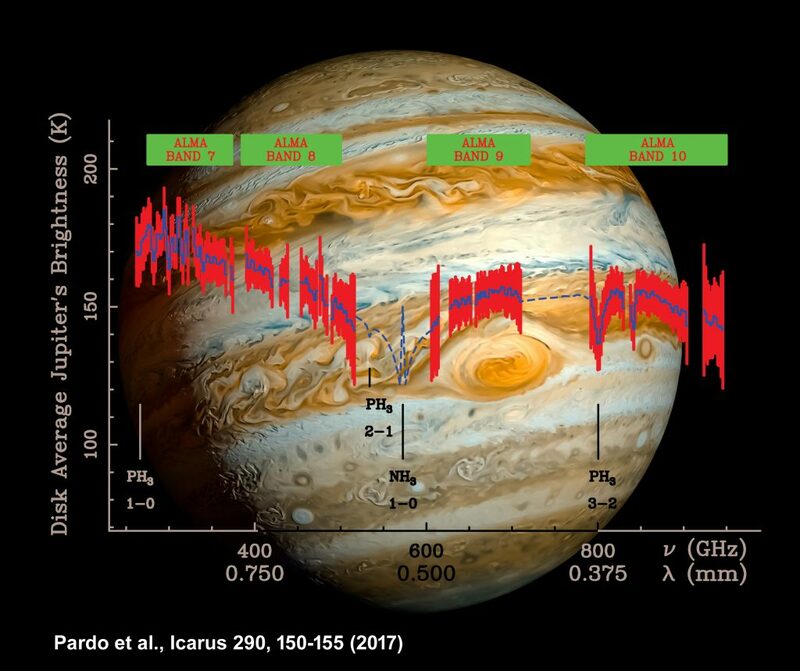 The calibrated data allowed the team to verify the predictions of standard radiative transfer models for both planets in this spectral region, and to confirm the absolute radiometry in the case of Jupiter. This careful calibration included the evaluation of the antenna performance over such a wide wavelength range and the removal of the Earth’s atmosphere effects, allowing the detection of broad absorption features on those planets’ atmospheres. As mentioned by Juan Ramón Pardo (lead author of the study, ICMM-CSIC, Spain), “Besides their physical interest, the results are also important as both planets are calibration references in the current era of operating ground-based and space-borne submillimetre instruments”. Jupiter and Saturn are gaseous giants much larger but less dense than the inner rocky planets of our Solar System. Their atmospheres are extremely thick. Very wide collision-broadened lines of Ammonia (NH3) and Phosphine (PH3) dominate the overall shape of their submillimetre spectrum. Most of the several thousand exoplanets discovered to date are gaseous giants thought to be similar to Jupiter and Saturn. Therefore, the now measured submillimetre spectrum of our giant neighbours could also help as a reference in future spectroscopic studies of other planetary systems. The team is composed of Juan R. Pardo (Molecular Astrophysics Group, ICMM, CSIC, Spain); Eugene Serabyn (NASA-Jet Propulsion Laboratory, California Institute of Technology, USA); Martina C. Wiedner (LERMA, Paris Observatory, PSL Research University, CNRS, Sorbonne Universités, UPMC, France); Raphäel Moreno (LESIA, Paris-Meudon Observatory, France); Glenn Orton (NASA-Jet Propulsion Laboratory, California Institute of Technology, USA). Using the IRAM 30 meter radio-telescope at the Pico Veleta (Spain), an international team of astronomers has obtained the most complete radio-observations of the Orion B star-forming region, famous for hosting the iconic Horsehead and Flame nebulae. Taking advantage of the fact that the cold molecular gas shines at radio wavelengths, the team revealed the hidden anatomy of Orion B. Through a careful dissection of the cloud into regions of different molecular composition, this work sheds new light on how the coldest and densest molecular clouds give birth to new stars. Stars are born in cold and dense condensations that develop in the interior of interstellar clouds. The strong winds and ultraviolet radiation from newly born stars then erodes and disrupts the parental cloud. Using the IRAM 30 meter radio-telescope in Pico Veleta (Spain), an international scientific program led by Jérôme Pety (IRAM & Observatoire de Paris, France), has achieved the most complete observation of the Orion B cloud in the radio domain. This region is a huge reservoir of interstellar matter (mostly gaseous molecules and dust grains), containing about 70,000 times the mass of the Sun. This project provides unprecedented images of a region of the sky that is only seen as a dark region in the visible. Moreover, the wealth of data opens the possibility to characterize the structure and the physical and chemical properties of molecular clouds in unprecedented detail. It is truly a dive into the inner anatomy of the Orion B cloud. “Diffuse gas, filaments, and dense condensations could be the equivalent of muscles, bones, and vital organs, respectively. 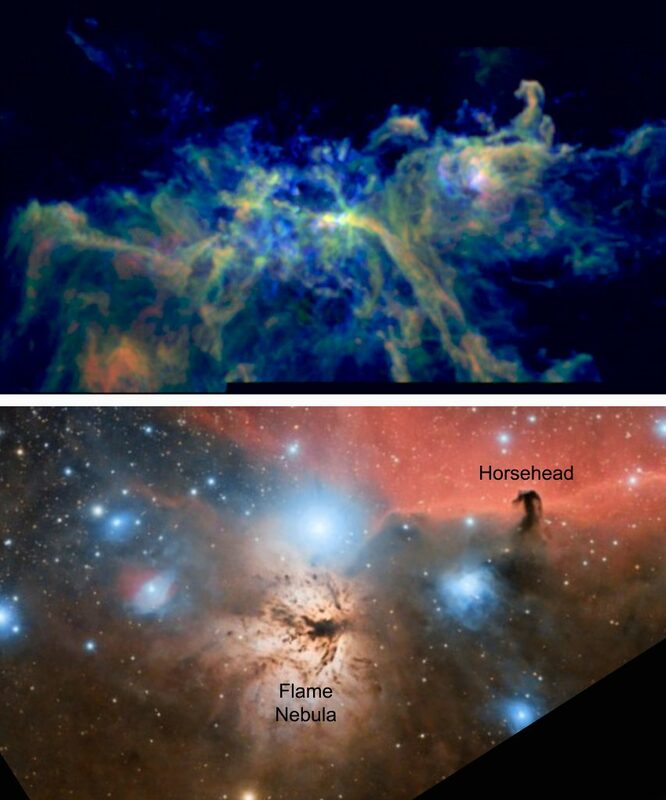 And the images of different molecular lines enable to radiography different parts of Giant Molecular Clouds, just like Magnetic Resonance Imaging (MRI) enables to reveal the interior of the human body” says Pety. 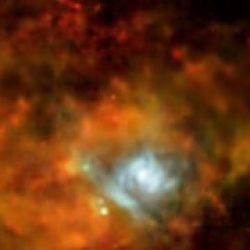 In the series of 3 articles accepted by Astronomy & Astrophysics, the team explains how the emission from different molecules is a very sensitive diagnostic tool of the gas physical conditions, its density, temperature, turbulence and the properties of the ultraviolet light arising from massive stars in the region. The team shows how the sites for future star-formation, the coldest and densest condensations, are only revealed by the emission from certain molecules such as the diazenylium ion (N2H+). Another important result is the discovery of a clear relationship between the kind of turbulent motions (shocks or vortices) and the local star formation activity. This pioneering work, involving the simultaneous statistical analysis of many molecular tracers will provide the needed tools to characterize star formation in the interstellar medium. It brings radio-astronomy into the era of big data! Astronomy is very inspiring and also very cinematographic. Our perception is determined by our experiences. This is why it is not surprising that, while observing the sky, we are able to find wonderful shapes and even characters (the origin of constellations names). Figure 1: Orion B molecular seen in the optical (lower panel: Image credit & copyright Sergi Verdugo Martínez) and as a composition of three radio emission lines observed in this work (12CO, 13CO and C18O isotopologues, upper panel). The ionized hydrogen gas shines in bright red in the optical, whereas radio observations reveal the intrinsic structure of the dense molecular gas (Image credit & copyright J. Pety, the ORION-B Collaboration & IRAM). 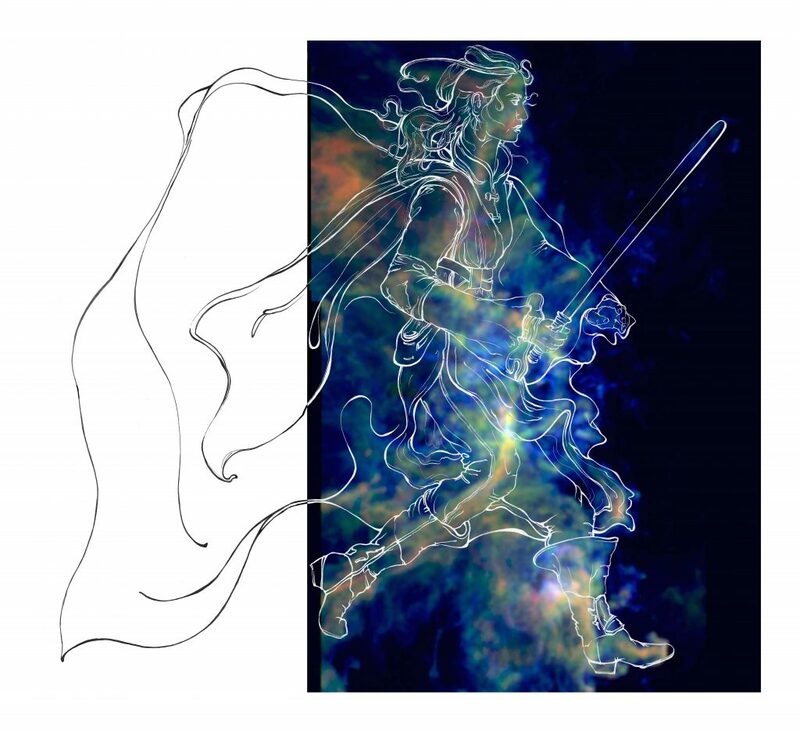 Figure 2: Artistic view of a Jedi knight overlaid on an image of the molecular gas from Orion B (Image Credit & Copyright: Audrey Pety). The ORION-B project results from 10 years of research. It was made possible by the advent of a new generation of wide bandwidth receivers combined with high resolution spectrometers at the IRAM 30 meter telescope, and builds on long experience in radio-astronomy by the team members. Jérôme Pety explains: “Using the IRAM 30 meter telescope, we undertook in 2011 a systematic survey of the chemical content of the Horsehead’s mane, during a project named Horsehead WHISPER. This allowed us to discover in 2012 a new molecule in the interstellar medium, the propynylidyne ion (C3H+) that is a member of the hydrocarbon family. Building on this success, we decided to generalize these observations, i.e., to observe one hundred thousand positions in Orion B instead of a single one towards the Horsehead nebula, each direction delivering information at 160,000 different frequencies!” Harvey Liszt, astronomer at NRAO, adds: “It’s flabbergasting to see how this field has grown tremendously. During my PhD, I tuned a precursor millimeter receiver to obtain the first noisy detection of carbon monoxide towards one direction in Orion B, together with Nobel prize winner Bob Wilson. And only 45 years later, we easily gets such wide maps for so many molecules over the whole cloud!” No doubt that the future will offer even faster and wider observations for radio-astronomers. When that happens, the pioneering statistical approach of the ORION-B project will provide the needed tools and experience to handle bigger and bigger datasets. 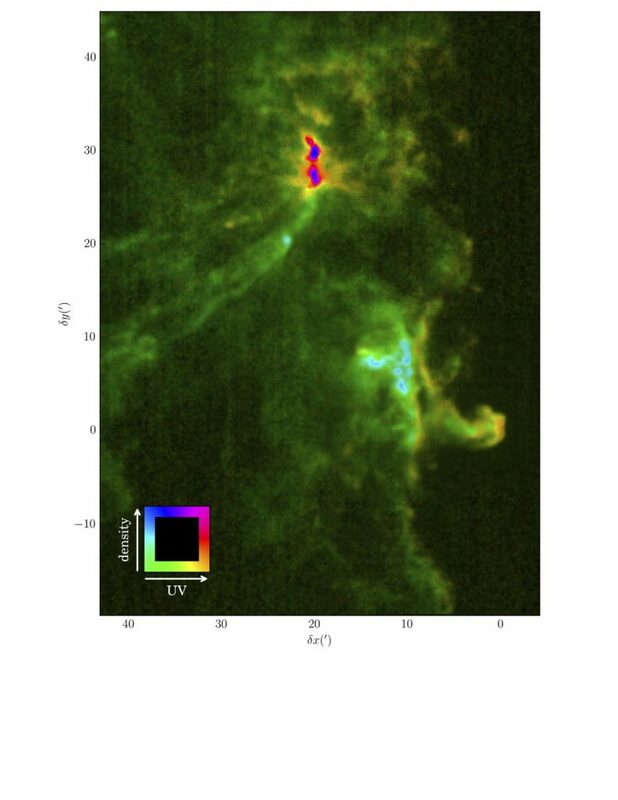 “The anatomy of the Orion B Giant Molecular Cloud: A local template for studies of nearby galaxies”, by Jérôme Pety, Viviana V. Guzmán, Jan H. Orkisz, Harvey S. Liszt, Maryvonne Gerin, Emeric Bron, Sébastien Bardeau, Javier R. Goicoechea, Pierre Gratier, Franck Le Petit, François Levrier, Karin I. Oberg, Evelyne Roueff, Albrecht Sievers. “Dissecting the molecular structure of the Orion B cloud: Insight from Principal Component Analysis”, by Pierre Gratier, Emeric Bron, Maryvonne Gerin, Jérôme Pety, Viviana V. Guzman, Jan Orkisz, Sébastien Bardeau, Javier R. Goicoechea, Franck Le Petit, Harvey Liszt, Karin Öberg, Nicolas Peretto, Evelyne Roueff, Albrecht Sievers, Pascal Tremblin. “Turbulence and star formation efficiency in molecular clouds: solenoidal versus compressive motions in Orion B”, by Jan H. Orkisz, Jérôme Pety, Maryvonne Gerin, Emeric Bron, Viviana V. Guzmán, Sébastien Bardeau, Javier R. Goicoechea, Pierre Gratier, Franck Le Petit, François Levrier, Harvey Liszt, Karin Öberg, Nicolas Peretto, Evelyne Roueff, Albrecht Sievers, Pascal Tremblin. The discovery of a new interstellar molecule confirms the existence of a petroleum refinery in our galaxy. Zooming into the skin of the Orion hunter.